The villa is built in an architectural style of a two floor maisonette. The ground floor, itself, is in two different levels and consists of the main living room with a fireplace, a separate dinning room and a very big open plan kitchen, while three steps lower a bedroom with its own bathroom and veranda is located and next to it, we find the gym room with a steam bath. Stepping to the second floor we have the second bedroom, also with its own bathroom and veranda and one level up the third bedroom with its own en-suite bathroom and veranda is located. 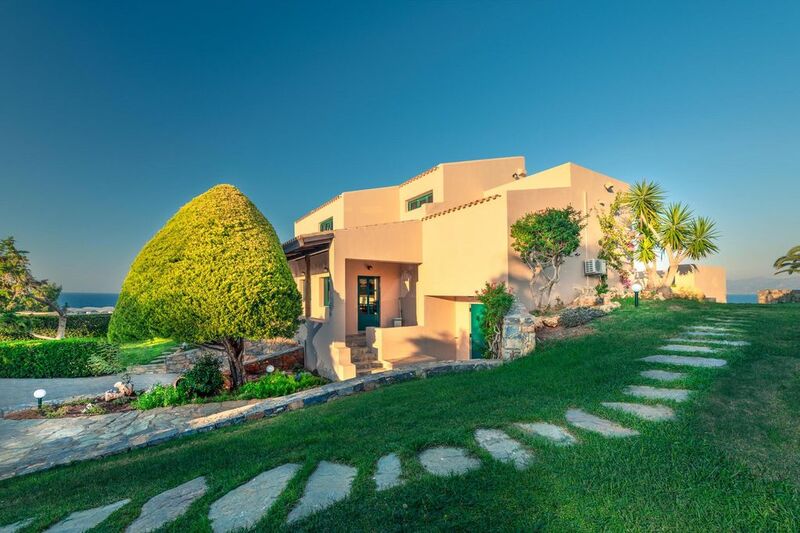 - The villa is located up on a hill with panoramic view of the bay and the village of Hersonissos. - Villa Aegean Blue is fully furnished, fully equipped and fully individual air-conditioned. - Villa Aegean Blue offers a fully equipped kitchen with all the modern amenities. My Name is Nikos , I am working in Tourist field for the last 25 years . i grow up in Crete and i live in Heraklion I love my Island ! We offer to all our valuable clients the Cretan hospitality and service 24 hours if needed. We offer private taxi Transfer free of Charge and a full welcome package upon arrival consisting of , fruits, wine, honey, yogurt etc ..
Not very long ago Chersonisos was a small fishing village, situated on a small peninsula and this is what its name means “Peninsula”. Nowadays, Hersonissos is a lively cosmopolitan resort, which truly offers something for everyone. Most of the action is centred on this peninsula that is now at the heart of a thriving resort with an excellent sandy beach, trendy boutiques and a great choice of restaurants and waterfront bars. When the sun has gone down and the moon is out, the bars and taverns become a hive of activity. There is always somewhere to go and something to see and do. When the moon goes down and the sun comes up, the life becomes quiet and relaxed again, then you can wander the main street to find the best buys, or sit in the shade of one of the bars and take a long drink. In the hillside behind Hersonissos lie three small traditional villages. There, the pace of life is much slower. The cobbled streets are lined with stone built houses, and the courtyards filled.